This Information Sheet highlights procedures on how to remove common stains from concrete surfaces. For advice on general cleaning, see the Information Sheet on Cleaning Concrete. It is preferable to remove contaminant and clean the concrete surface as soon as possible before spillages result in staining. This will help to avoid the substance penetrating the concrete surface. It is always better to remove the contaminant and clean the concrete surface as soon as possible to avoid the substance penetrating into the concrete surface, making it more difficult to remove. Avoid the use of absorbent materials such as paper towels and cloths to soak up contaminants; as this tends to spread/drive contaminants such as oil into the concrete. To reduce the risk of contaminants penetrating into the concrete and make stain removal easier, a suitable sealer can be applied to the concrete surface when new or after cleaning. Wet the concrete surface, apply chlorine bleach, and scrub vigorously, before rinsing thoroughly. A deposit of dead fungal residue will usually be noticeable within a few days. This should then be brushed with a stiff bristle broom and the process repeated if necessary. Alternatively, use a high-pressure water cleaner to remove fungal growth and then broom chlorine bleach over the surface before rinsing thoroughly with clean water,” Perrie advises. If your children have dropped chewing gum on a concrete surface, and car tyres or footprints have smeared it to the concrete surface, you should solidify the gum with ice cubes and scrape off as much as possible. Then apply a poultice (cat litter or a similar inert absorbent material) saturated with methylated spirits. Apply the poultice and allow to dry. “This should turn the residue gum brittle, making it possible to remove it with a stiff bristle brush. Finish the process by washing the affected area with hot soapy water, then rinse with clean water.” Perrie says another method is to scrape off as much of the chewing gum as possible and then remove the rest with a solvent such as amyl acetate. Scrub stain vigorously with warm soapy water and then rinse with clean water. Stubborn stains may require scrubbing with chlorine bleach: first wet the surface, then apply bleach, scrub and rinse. Steam cleaning may provide an effective method for large contaminated areas. Scrub stain vigorously with warm soapy water and then rinse with clean water. If this is not effective, try a poultice saturated with a solution of 1 part glycerol to 4 parts water. Allow to react with the stain for at least 24 hours before removing and hosing affected area. The area may need to be scoured with abrasive cleaning powder to remove the remains of the poultice. Apply a dishwashing detergent using a stiff brush to work the detergent into the stain. In dry weather, apply an absorbent product such as cat litter, baby powder or sawdust to lift the stain. (Should you use cat litter, you’ll need to crush it into a fine powder first). In dry weather sprinkle a thick layer of the absorbent material over the stain. In order to remove larger stains, try a specialist-degreasing product. Ensure that you follow the manufacturer’s instructions and that the product is suitable concrete area. Large-scale or heavy oil stains will most likely require a specialist oil remover or degreaser , which is designed to remove oil stains without damaging the surface. 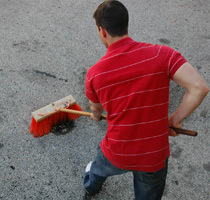 Firstly – sweep the area to be cleaned to remove any remaining dust or dirt. Make sure to use the manufacturer’s instructions for usage and wear the necessary protection gear. Apply the degreaser as per the manufacturer’s instructions to the stain, and allow to rest for the allotted time. If need be, use a stiff deck brush to work the remover into the concrete. Apply the label instructions when removing the product, and give the surface a final rinse cold clean water. Scrub vigorously with chlorine bleach then rinse the surface. Cover stain with a cloth soaked in bleach, repeating this process until a satisfactory result is achieved. Scrub regularly between bleach treatments. Rinse thoroughly. Haddad, G J and Freedman, S ‘Removing stains from concrete’ Modern Concrete, July and August 1970. Cement & Concrete Institute, Midrand, South Africa, 2001. Concrete Construction, June to November, 1986. Efflorescence Data Sheet, Cement Concrete & Aggregates Australia, June 2006. Disclaimer: This article is produced to provide information on the uses of cement, concrete and aggregates and to also provide information on how to clean these surfaces. The information provided is intended for general guidance only and in no way replaces the services of professional consultants on particular projects – no legal liability can be accepted by any of the abovementioned sources, CCAA, The Cleanchem Company or Unilever.